Portfolio Categories: 1970 and W.
Frank Wojnarowski, a resident of Fairfield, Connecticut, was born in Sanok, Poland. He started the Frank Wojnarowski Orchestra thirty years ago; his instrument was the violin. His sister Eleanore was the original vocalist in the band. Their first break, a recording session with Dana Records, came in 1947 – “Bije Mamcia” was their first record. Shortly after came a big hit, “Jedzie Boat.” This is the record that touched off the polka craze in New England, which, during that period, went through its golden years, lasting through the fifties. Other hits followed, like “Goral,” “Jasiu, Jasiu,” “Oh Suzanna,” “Rozmaria,” etc. He then wrote, sang and recorded his big one – “Matka.” For this he received a gold record award. After Dana Records sold their company and discontinued making records, Frank recorded for Silverbell, Dyno, and presently is on RMI Records. Frank toured and played all over the United States and Canada. His longest tour lasted eight weeks. Besides being popular in New England and Pennsylvania, he drew the largest crowds in the Detroit area for the late WJLB radio personality, Eugene Konstantynowicz, at his annual outdoor event in Warsaw Park. Frank played this event for eight consecutive years. In the early fifties, Frank was busy with his own radio show on WLIZ in Bridgeport doing live shows with the band. 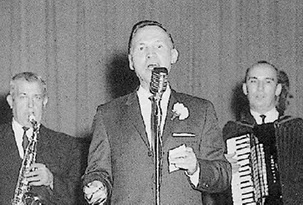 He went on to greater things when he hosted his own “Pic A Polka” TV Show in Buffalo, New York. This show lasted over two years, and in its prime it had a higher rating than the Ed Sullivan Show in the Buffalo area. The Frank Wojnarowski Orchestra was called on to play top polka events, such as the Milwaukee Summerfest, Ocean Beach Festival and the IPA Convention. When the band was not on tour, Frank could be found at his Fairfield, Connecticut, home with his wife Wanda. He liked chicken and had a sweet tooth for pastries.